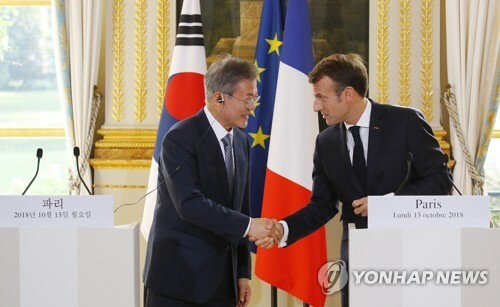 PARIS, Oct. 16 (Yonhap) — South Korean President Moon Jae-in will hold bilateral meetings with British Prime Minister Theresa May, German Chancellor Angela Merkel and Thai Prime Minister Prayut Chan-o-cha on the sidelines of Asia-Europe Meeting (ASEM) in Belgium this week, the presidential office said Tuesday. Moon is currently on a nine-day tour of France, Italy, the Vatican, Belgium and Denmark until Sunday. He will attend the ASEM summit Friday. “President Moon will hold bilateral summits with the British prime minister, German chancellor and Thai prime minister during his participation in the ASEM meeting in Belgium on Oct. 19,” a presidential official told reporters. During the summits, Moon is expected to discuss bilateral ties and request their support for efforts to denuclearize North Korea. France and Britain are permanent members of the U.N. Security Council along with the United States, China and Russia. Moon is set to arrive in Italy on Tuesday. He will visit the Vatican later this week before flying to Belgium. Moon’s trip will end in Denmark, where he will attend the inaugural summit of the Partnering for Green Growth and the Global Goals 2030, also known as P4G.